This Cashier Booth features optional ribbed roof fascia hides roof mounted air conditioner while giving the building a built-at-site look. 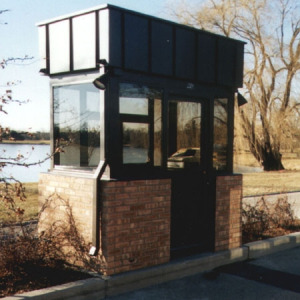 Exterior of unit was shipped with mesh around the walls and brick was field installed by the customer to match existing administration buildings close by. Built from galvanized steel and totally welded framework. Pick your color from our large color chart. Cashier booths ship totally assembled, ready to set, connect and use! This cashier booth is just a sample of what Little Buildings can do. Put us to the test, let us build a new design for you!